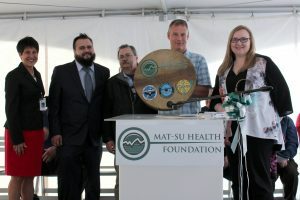 Connect Mat-Su officially opened on Friday, May 18. The ceremony kicked off with speeches from Mat-Su Health Foundation leaders, community leaders, and partners. Southcentral Foundation Vice President April Kyle attended and spoke briefly about the importance of community organizations working together to meet the needs of the area they serve. Representatives from the Chickaloon Traditional Village Council and the Knik Tribal Council joined her as they presented a hand painted drum to the new organization, symbolizing the heartbeat of the community the partnership creates as we walk this new path together. To learn more about Connect Mat-Su, visit their new location at 777 N. Crusey Street in Wasilla, or call (907) 373-2628.